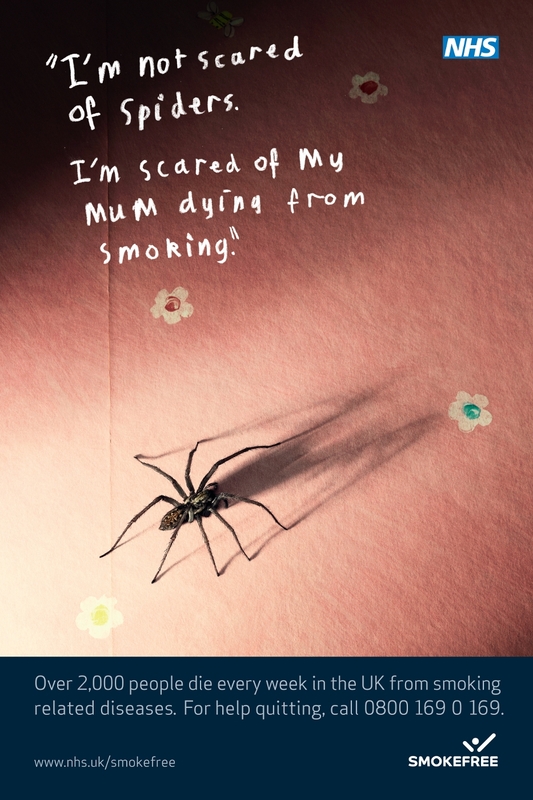 The British National Health Service (NHS) “I’m not scared” anti-smoking television campaign, launched at Halloween in October 2008, is now being shown after 7.30 pm only after complaints about frightened children. TV and radio advertisements, designed to show children’s fear of their parents dying of smoking-related illness, have led to complaints to the Advertising Standards Authority. The TV commercial opens on a darkened child’s bedroom. A young girl declares that she is not afraid of the dark. “I’m not scared of spiders”, she says, before going on to declare her lack of fear of clowns or bullies (Becky Taylor). 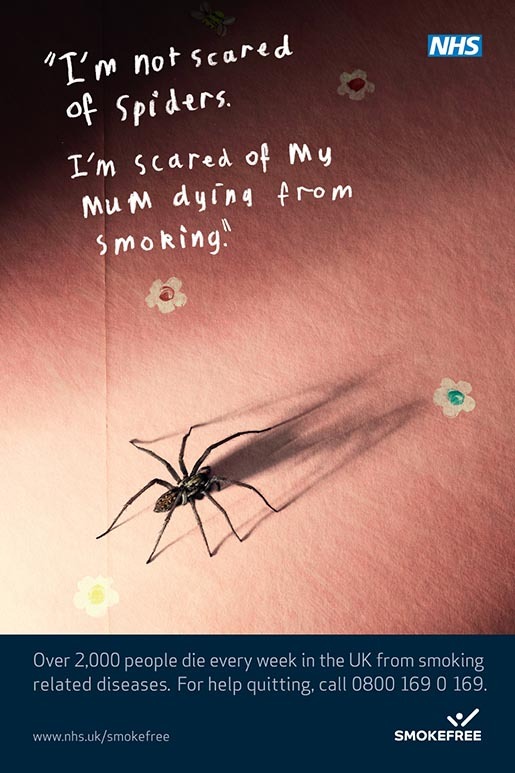 The ad ends with a group of young mums who are chatting together and smoking; the girl says “I’m scared of my mum smoking”. One of the mums turns and smiles at the camera and the girl says “I’m scared that my mum will die”. Text on the screen declares that iver 2,000 people die every week in the UK from smoking related diseases. The Department of Health felt it was important that smokers should hear the message in the company of their children, because it prevented them from avoiding the issue and would motivate them to quit smoking. 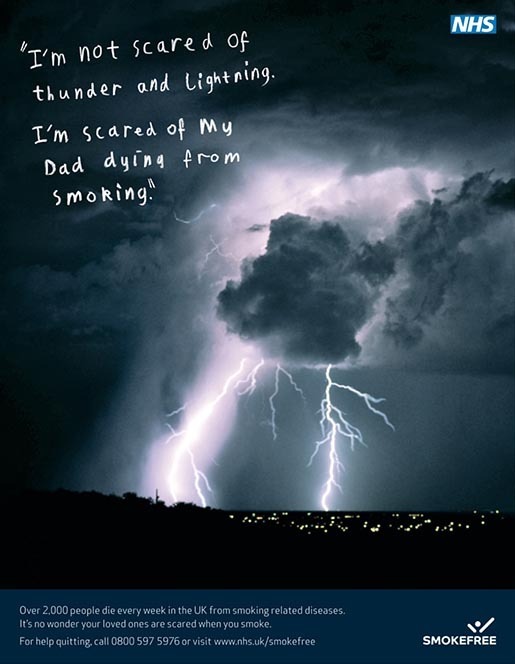 The ASA said it recognised the “serious and worthwhile” nature of an advert designed to make parents consider the emotional impact of smoking on their children, but judged it necessary to balance targeting that audience with avoiding distress to young children. The organisation was concerned that children might end up watching the advertisement alone without parental support or reassurance. Another commercial uses the same approach, targeted at teenagers. 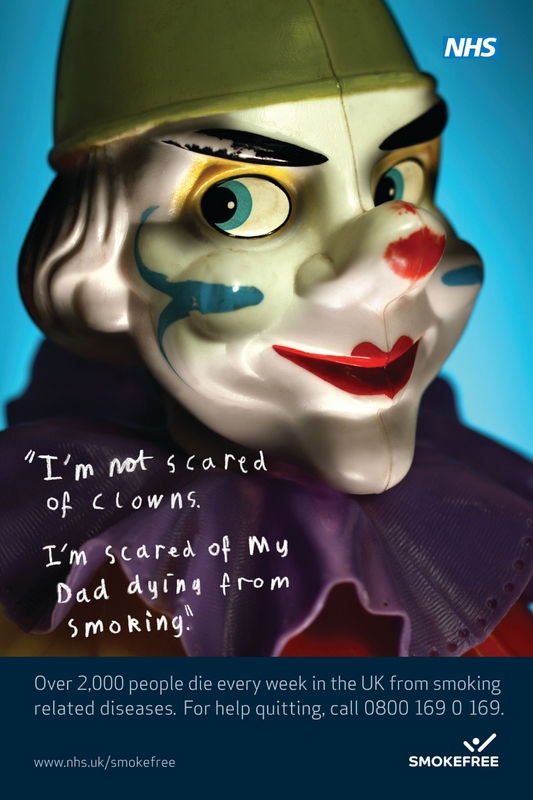 The Not Scared campaign was developed at Miles Calcraft Briginshaw Duffy by creatives Jeremy Carr and Ken Hoggins. Filming for Not Scared was shot by director Walter Stern via Academy Films, London, with director of photography Marcel Zyskind and producer Lucy Gossage. Editor was Jonnie Scarlett at The Quarry, London. Telecine was done at The Mill, London. Filming for Not Worried was shot by director Peter Cattaneo via Academy Films.